In England and the United States, the police were invented within the space of just a few decades — roughly from 1825 to 1855. — and the threat of slave insurrections in the South. So the police are a response to crowds, not to crime. I will be focusing a lot on who these crowds were, how they became such a challenge. We’ll see that one difficulty for the rulers, besides the growth of social polarization in the cities, was the breakdown of old methods of personal supervision of the working population. In these decades, the state stepped in to fill the social breach. We’ll see that, in the North, the invention of the police was just one part of a state effort to manage and shape the workforce on a day-to-day basis. Governments also expanded their systems of poor relief in order to regulate the labor market, and they developed the system of public education to regulate workers’ minds. I will connect those points to police work later on, but mostly I’ll be focusing on how the police developed in London, New York, Charleston (South Carolina), and Philadelphia. To get a sense of what’s special about modern police, it will help to talk about the situation when capitalism was just beginning. Specifically, let’s consider the market towns of the late medieval period, about 1,000 years ago. The dominant class of the time wasn’t in the towns. The feudal landholders were based in the countryside. They didn’t have cops. They could pull together armed forces to terrorize the serfs — who were semi-slaves — or they could fight against other nobles. But these forces were not professional or full-time. The population of the towns was mostly serfs who had bought their freedom, or simply escaped from their masters. They were known as bourgeois, which means town-dweller. The bourgeoisie pioneered economic relations that later became known as capitalism. For the purposes of our discussion, let’s say that a capitalist is somebody who uses money to make more money. At the beginning, the dominant capitalists were merchants. A merchant takes money to buy goods in order to sell them for more money. There are also capitalists who deal only with money — bankers — who lend out a certain amount in order to get more back. You could also be a craftsman who buys materials and makes something like shoes in order to sell them for more money. In the guild system, a master craftsman would work alongside and supervise journeymen and apprentices. The masters were profiting from their work, so there was exploitation going on, but the journeymen and apprentices had reasonable hopes of becoming masters themselves eventually. So class relations in the towns were quite fluid, especially in comparison to the relation between noble and serf. Besides, the guilds operated in ways that put some limits on exploitation, so it was the merchants who really accumulated capital at that time. In France, in the 11th and 12th centuries, these towns became known as communes. They incorporated into communes under various conditions, sometimes with the permission of a feudal lord­, but in general they were seen as self-governing entities or even city-states. But they didn’t have cops. They had their own courts — and small armed forces made up of the townsmen themselves. These forces generally had nothing to do with bringing people up on charges. If you got robbed or assaulted, or were cheated in a business deal, then you, the citizen, would press the charges. One example of this do-it-yourself justice, a method that lasted for centuries, was known as the hue and cry. If you were in a marketplace and you saw somebody stealing, you were supposed to yell and scream, saying “Stop, thief!” and chase after the thief. The rest of the deal was that anybody who saw you do this was supposed to add to the hue and cry and also run after the thief. The towns didn’t need cops because they had a high degree of social equality, which gave people a sense of mutual obligation. Over the years, class conflicts did intensify within the towns, but even so, the towns held together — through a common antagonism to the power of the nobles and through continued bonds of mutual obligation. For hundreds of years, the French carried an idealized memory of these early commune towns — as self-governing communities of equals. So it’s no surprise that in 1871, when workers took over Paris, they named it the Commune. But that’s jumping a little farther forward than we should just yet. Capitalism underwent major changes as it grew up inside feudal society. First of all, the size of capital holdings grew. Remember, that’s the point — to make smaller piles of money into bigger piles of money. The size of holdings began to grow astronomically during the conquest of the Americas, as gold and silver were looted from the New World and Africans were kidnapped to work on plantations. More and more things were produced for sale on the market. The losers in market competition began to lose their independence as producers and had to take wage jobs. But in places like England, the biggest force driving people to look for wage work was the state-endorsed movement to drive peasants off the land. The towns grew as peasants became refugees from the countryside, while inequality grew within the cities. The capitalist bourgeoisie became a social layer that was more distinct from workers than it used to be. The market was having a corrosive effect on solidarity of craft guilds — something I’ll take up in more detail when I talk about New York. Workshops got bigger than ever, as a single English boss would be in command of maybe dozens of workers. I’m talking about the mid-1700s here, the period right before real factory industrialization began. There still weren’t cops, but the richer classes began to resort to more and more violence to suppress the poor population. Sometimes the army was ordered to shoot into rebellious crowds, and sometimes the constables would arrest the leaders and hang them. So class struggle was beginning to heat up, but things really began to change when the Industrial Revolution took off in England. At the same time, the French were going through a political and social revolution of their own, beginning in 1789. The response of the British ruling class was to panic over the possibility that English workers would follow the French lead. They outlawed trade unions and meetings of more than 50 people. Nevertheless, English workers put together bigger and bigger demonstrations and strikes from about 1792 to 1820. The ruling class response was to send in the army. But there are really only two things the army could do, and they’re both bad. They could refuse to shoot, and the crowd would get away with whatever it came to do. Or they could shoot into the crowd and produce working-class martyrs. This is exactly what happened in Manchester in 1819. Soldiers were sent charging into a crowd of 80,000, injuring hundreds of people and killing 11. Instead of subduing the crowd, this action, known as the Peterloo Massacre, provoked a wave of strikes and protests. Even the time-honored tactic of hanging the movement’s leaders began to backfire. An execution would exert an intimidating effect on a crowd of 100, but crowds now ranged up to 50,000 supporters of the condemned man, and the executions just made them want to fight. The growth of British cities, and the growth of social polarization within them—that is, two quantitative changes — had begun to produce qualitatively new outbreaks of struggle. The ruling class needed new institutions to get this under control. One of them was the London police, founded in 1829, just 10 years after Peterloo. The new police force was designed specifically to inflict nonlethal violence upon crowds to break them up while deliberately trying to avoid creating martyrs. Now, any force that’s organized to deliver violence on a routine basis is going to kill some people. But for every police murder, there are hundreds or thousands of acts of police violence that are nonlethal — calculated and calibrated to produce intimidation while avoiding an angry collective response. When the London police were not concentrated into squads for crowd control, they were dispersed out into the city to police the daily life of the poor and working class. That sums up the distinctive dual function of modern police: There is the dispersed form of surveillance and intimidation that’s done the name of fighting crime; and then there’s the concentrated form of activity to take on strikes, riots, and major demonstrations. That’s what they were invented for — to deal with crowds — but what we see most of the time is the presence of the cop on the beat. Before I talk about the evolution of police in New York, I want to explore the connection between these two modes of police work. First, about work. While successful merchants could control indoor spaces, those without so many means had to set themselves up as vendors on the street. The established merchants saw them as competitors and got the police to remove them. Street vendors are also effective purveyors of stolen goods because they’re mobile and anonymous. It wasn’t just pickpockets and burglars who made use of street vendors this way. The servants and slaves of the middle class also stole from their masters and passed the goods on to the local vendors. (By the way, New York City had slavery until 1827.) The leakage of wealth out of the city’s comfortable homes is another reason that the middle class demanded action against street vendors. impartial, attempting to sweep off the streets with an equable hand street traders, beggars, prostitutes, street-entertainers, pickets, children playing football and freethinking and socialist speakers alike. The pretext very often was that a complaint of interruption of trade had been received from a shopkeeper. Outdoor life was — and is — especially important to working-class politics. Established politicians and corporate managers can meet indoors and make decisions that have big consequences because these people are in command of bureaucracies and workforces. But when working people meet and make decisions about how to change things, it usually doesn’t count for much unless they can gather some supporters out on the street, whether it’s for a strike or a demonstration. The street is the proving ground for much of working-class politics, and the ruling class is fully aware of that. That’s why they put the police on the street as a counter-force whenever the working class shows its strength. Now we can look at the connections between the two major forms of police activity — routine patrols and crowd control. The day-to-day life of patrolling gets police accustomed to using violence and the threat of violence. This gets them ready to pull off the large-scale acts of repression that are necessary when workers and the oppressed rise up in larger groups. It’s not just a question of getting practice with weapons and tactics. Routine patrol work is crucial to creating a mindset among police that their violence is for the greater good. The day-to-day work also allows commanders to discover which cops are most comfortable inflicting pain — and then to assign them to the front lines when it comes to a crackdown. At the same time, the “good cop” you may meet on the beat provides crucial public-relations cover for the brutal work that needs to be done by the “bad cops.” Routine work can also become useful in periods of political upheaval because the police have already spent time in the neighborhoods trying to identify the leaders and the radicals. Now we can jump back into the historical narrative and talk about New York City. I’ll begin with a couple of points about the traditions of crowds before the revolution. During the colonial period, people got rowdy sometimes, but it was often formalized in ways that the colonial elite would approve or at least tolerate. There were various celebrations that fell in the category of “misrule,” in which social positions were reversed and the lower orders could pretend that they were on the top. This was a way for the subordinate classes to blow off steam by satirizing their masters — a way that acknowledged the right of the elite to be in charge on every other day of the year. This tradition of symbolic misrule was especially prominent around Christmas and New Year’s. Even slaves would be allowed to participate. There was also a yearly celebration of Pope Day, in which members of the Protestant majority would parade around with effigies, including one of the Pope — until they burned them all at the end. A little sectarian provocation, “all in good fun,” all approved by the city fathers. At that point, Pope Day didn’t usually lead to violence against actual Catholics because there were only a few hundred in New York and not a single Catholic church before the revolution. These crowd traditions were loud and even riotous, but they tended to reinforce the connection between the lower orders and the elite, not to break that connection. The lower orders were also bound to the elite by constant personal supervision. This applied to slaves and house servants, of course, but apprentices and journeyman craftsmen also lived in the same house with the master. So there were not a lot of these subordinate people roaming around the streets at all hours. This, of course, is an example of policing without a police agency. New Amsterdam’s elite was commanding employers to supervise waterfront workers during off-work hours, much as masters would oversee their slaves, servants and apprentices. The colonial authorities could see that unattached, free wage laborers — even in fairly small numbers — could disrupt the norms of this patrician society. Their response was to make these laborers less free by trying to “attach” them to their bosses. Under circumstances like these, where most people in the colony were already supervised during the day, there was no need for regular police force. There was a night watch, which looked out for fires, tried to guard against vandalism and arrested any Black person who couldn’t prove that s/he was free. The watch was not professional in any way. All of them had day jobs and rotated into watch duty temporarily, so they didn’t patrol regular beats — and everybody hated doing it. The rich bought their way out of it by paying for substitutes. During the day, a small number of constables were on duty, but they didn’t patrol. They were agents of the court who executed writs like summonses and arrest warrants. They did not do detective work. In the 1700s and well into the 1800s, the system relied almost entirely on civilian informants who were promised a portion of any fine that the offender might have to pay. The revolutionary period changed a few things about the role of crowds and the relation between classes. In the 1760s, beginning with the agitation against the Stamp Act, the elite of merchants and property-holders endorsed new forms of popular mobilization. These were new loud demonstrations and riots that borrowed from existing traditions, obviously in the use of effigies. Instead of burning the Pope, they’d burn the governor, or King George. I don’t have time to go into detail about what they did, but it’s important to note the class composition of these crowds. Members of the elite might be there themselves, but the body of these crowds was the skilled workers, collectively known as the mechanics. That means that a master would be out in the crowd with his journeymen and apprentices. People of higher social rank tended to view the master craftsmen as their lieutenants for mobilizing the rest of the mechanics. As the conflict with Britain intensified, the mechanics became more radicalized and organized themselves independently from the colonial elite. There was friction between the mechanics and the elite, but never a complete breach. And, naturally, when the British were defeated and the elite set up their own government, they had had enough of all this street agitation. There continued to be rebellions and riots in the new independent United States, but they were taking new shapes — partly because economic development was breaking up the unity of the mechanics themselves. I’ll turn now to those developments that followed the revolution — changes that produced a new working class out of a conflicted hodgepodge of social elements. Let’s start with the skilled workers. Even before the revolution, the division between masters and journeymen had sharpened. To understand this, we should look more closely at the lingering influence of the guild system; formal guilds did not exist in United States, but some of their traditions lived on among skilled workers. The old guilds had essentially been cartels, unions of workers who had a monopoly on a particular skill that allowed them to manage the market. They could set customary prices for their goods and even decide beforehand how big the market was going to be. The managed market allowed for some customary stability of relations among workers of the same trade. A master acquired an apprentice as an indentured servant from his parents in return for a promise of teaching him a skill and giving him room and board for seven years. Apprentices graduated to become journeymen, but often continued to work for the same master as long as there is no slot for them to become masters themselves. Journeymen received customary wages with long-term contracts. This meant that pay would keep coming in despite seasonal variations in the amount of work. Even without the formal structure of guilds, much of this customary set of relations was still in place in the pre-revolutionary period. From about 1750 to 1850, however, this corporative structure within the skilled trades was falling apart because the external relation — the tradesmen’s control of the market — was also beginning to break down. Trade that came from other cities or from overseas would undermine the masters’ ability to set prices, so workshops were thrown into competition with each other in a way that’s familiar today. Competition drove the masters to become more like entrepreneurs, seeking out labor-saving innovation and treating their workers more like disposable wage workers. Enterprises became larger and more impersonal — more like factories, with dozens of employees. In the first decades of the 19th century, employees were not only losing their long-term contracts, but they also were losing their place to live in the masters’ households. The apprentices found this to be a liberating experience, as young men got out from under the authority of their parents and their masters. Free to come and go as they pleased, they could meet young women and create their own social life among their peers. Working women were employed mostly in household service of various types unless they were prostitutes. Outdoor life became transformed as these young people mingled with the other parts of the population that comprised the developing working class. The mingling wasn’t always peaceful. Irish Catholic immigration expanded after 1800. By 1829, there were about 25,000 Catholics in the city — one person out of eight. The Irish were segregated by neighborhood, often living alongside Blacks, who themselves were now about 5 percent of the population. In 1799, Protestants burned an effigy of St. Patrick, and the Irish fought back. These battles recurred over the next few years, and it was clear to the Irish that the constables and the watch were taking sides against them. So, before there were even modern police forces, the lawmen were doing racial profiling. The city’s elite took note of the Irish lack of respect for the watch — their open combativeness — and responded by expanding the watch and making its patrols more targeted. This went along with increasing police attention to Africans, who lived in the same areas and often had the same attitude toward the authorities. Underlying the sectarian and racial divisions were economic competition, since Irish workers were generally less skilled and drew lower wages than craft workers. At the same time, masters were trying to de-skill the jobs in the workshops. In this way, Anglo apprentices became part of a real labor market as they lost their long-term contracts. When this happened, they found themselves just a rung above Irish immigrants on the wage scale. Black workers, who performed domestic service or worked as general laborers, were a further rung or two down the wage scale from the Irish. At the same time, the older unskilled part of the wage-working class, centered around the docks and building construction, was expanding because trade and construction both expanded after the Revolution. Overall, population expanded rapidly. New York was 60,000 in 1800, but it doubled in size by 1820. In 1830, New York had more than 200,000 people — and 312,000 by 1840. That’s a rough profile of the New York’s new working class. In these decades, all sections of the class went into collective action on their own behalf. It’s quite a complicated story, because of the number of actions and the fragmentation of the class. But we could start with a generalization that the most common form of struggle was also the most elementary — the riot. Now some specifics. From 1801 to 1832, Black New Yorkers rioted four times to prevent former slaves from being sent back to their out-of-town masters. These efforts generally failed, the watch responded violently, and the participants received unusually harsh sentences. 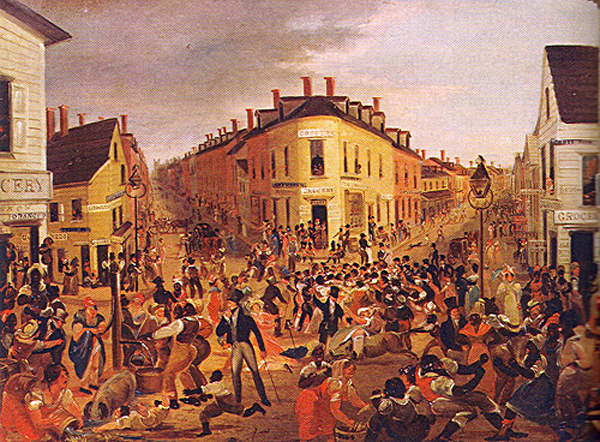 White abolitionists joined in the condemnations of these riots. So these riots illustrate popular self-activity despite elite disapproval — not to mention racial disparity in the application of the law. There was also white harassment of Black churches and theaters, sometimes rising to the level of riots. Poor immigrants were involved, but sometimes rich whites and the constables themselves took part. One anti-Black riot raged for three days in 1826, damaging Black houses and churches — along with houses and churches of white abolitionist ministers. But there wasn’t just conflict between Black and white workers. In 1802, white and Black sailors struck for higher wages. As with most strikes during this period, the method was something that historian Eric Hobsbawm called “collective bargaining by riot.” In this case, strikers disabled the ships that were hiring at the lower wages. Dockworkers also united across racial and sectarian lines for militant strikes in 1825 and 1828. Job actions by skilled workers like journeymen didn’t usually need to resort to such physical coercion, because they possessed a monopoly on the relevant skills. Journeymen nevertheless became more militant in these years. Strikes in the skilled trades happened in 3 waves, starting in 1809, 1822 and 1829. Each wave was more militant and coercive than the previous — as they targeted other skilled workers who broke solidarity. In 1829, the journeymen led a movement to limit the workday to 10 hours and created the Workingmen’s Party. The party collapsed in the same year, but it led to the founding the General Trade Union in 1833. While workers grew more conscious of themselves as a class, they also began to engage in more and more “run-of-the-mill” riots wherever crowds gathered, in taverns or in theaters or in the street. Such riots may have had no clear economic or political objective, but they were still instances of collective self-assertion by the working class—or by ethnic and racial fractions of the class. In the opening decades of the century, there was one of these riots about four times a year, but in the period from 1825 to 1830, New Yorkers rioted at a rate of once per month. One of these riots in particular alarmed the elite. At New Year’s of 1828, a noisy crowd of about 4,000 young Anglo workers brought out their drums and noisemakers and headed toward Broadway where the rich lived. They “procured an enormous Pennsylvania [covered] waggon” and pulled it with “a large rope several rods in length [1 rod = 16.5 feet],” according to an anonymous report in the Evening Post. On the way, they busted up an African church and beat the church members. The watch arrested several of the rioters, but the crowd rescued them and sent the watch running. The crowd drew in more revellers and turned toward the commercial district, where they busted up some stores. At the Battery, they broke windows in some of the city’s richest homes. Then they headed back up Broadway, where the rich were having their own celebration at the City Hotel. The street became in a short time blocked up with an impenetrable crowd, and the hackney coaches conveying home the ladies and gentlemen, were obstructed and not suffered to pass. The inconvenience became so great, that a strong party of watchman was collected with a view of taking into custody the leaders, and dispersing the rest. This spectacle of working-class defiance took place in full view of the families that ran New York City. Newspapers called for a major expansion of the watch. The 1828 riot — and a year of major riots in 1834 — accelerated a set of incremental reforms that finally led to the creation the New York City Police Department in 1845. The reforms of 1845 enlarged the police force, professionalized them, and centralized them with a more military chain of command. The watch was expanded to 24 hours, and policemen were forbidden from taking a second job. The pay was increased, and police no longer received a portion of the fines that were extracted from offenders. This meant the cops were no longer going out on patrol looking for how they were going to make a living, a process that could lead to a strange selection of prosecutions. Eliminating the fee system gave commanders greater freedom to set policy and priorities — and thus made the department more responsive to the shifting needs of the economic elite. That’s how the New York police got started. The story of police in the South is a bit different, as you might expect. These were generally volunteer forces of white citizens (often reluctant volunteers) who provided their own weapons. Over time, the slavemasters adapted the rural system to city life. Charleston’s population did not explode like New York’s. In 1820, there were still only about 25,000 people — but more than half of them were African American. Charleston was a commercial center, beginning in colonial times as South Carolina’s main site for the export of indigo and rice. The city was also a major port for the arrival of Africans for sale — either directly from Africa or from Caribbean slave colonies. After Congress banned the import of slaves in 1808, Charleston picked up as a major trans-shipment and sales center for slaves bound from Virginia and the Carolinas to Alabama, Mississippi and Louisiana. These three states of the “Deep South” needed a steady influx of enslaved workers to keep up with the 19th-century demand for cotton. The textile mills in Britain and New England were driving the Industrial Revolution, and the slave labor of the Deep South was an integral part of the boom. Charleston did not lie on the main axis of this boom, which was anchored by burgeoning cities such as New Orleans and Birmingham, England. Nevertheless, Charleston’s city life — both economic and social — was linked to the development of capitalist economic relations in other port cities on both sides of the Atlantic. Many of South Carolina’s large plantation owners kept a home in Charleston, so the state’s major slavemasters also dominated the politics of the state’s major city. Like the ruling classes of other Atlantic commercial cities, Charleston’s elite needed a workforce that could expand, contract and adapt according to the ups and downs of the market. Slavery, however, is a rigid way to organize workers, since slaves need to be fed and clothed whether or not there’s work for them to do; in slack times, slaves just become an expense for the master. For this reason, the masters in Charleston and other slave cities began — even in colonial times — to put slaves to work in wage jobs. Some slaves were owned directly by factory owners, especially in the South’s most industrial city, Richmond. Most of Charleston’s slaves, however, were owned by white town-dwellers who used some of them for personal service and “hired out” the rest to wage-paying employers. A couple of Charleston rice mills owned the slaves they used, but they also hired out their slaves to others when the mills weren’t pushed to full capacity. At first the masters found the jobs for their slaves and took all of the wages for themselves. But many masters soon found it most convenient to let their slaves find their own jobs while collecting a flat fee from the slave for the time spent away from the master. A master could take in an annual return of 10 to 15 percent of a slave’s purchase price by hiring him or her out. Many African Americans could even afford to “live out” — finding housing outside their masters’ households. Slaves could marry and cohabit independently. Some skilled slave artisans even began hiring wage workers themselves. This included some women, who worked as seamstresses and dominated the city’s garment trade. Most slaves engaged in wage work were men, however, who worked in several skilled trades, short-term unskilled labor, and the transport of goods. Women, who formed the majority of Black Charlestonians, worked mostly as household slaves. By the first decades of the 19th century, Charleston had a predominantly Black suburb known as “Charleston Neck,” populated mostly by slaves alongside some free people of color. Charleston is built on the southward-pointing tip of a peninsula between two rivers, and residents referred to the unincorporated northern part of the peninsula as “The Neck.” In 1850, and almost certainly before, more than one-quarter of Charleston’s Blacks lived in housing without white supervision: They were either free or were slaves who “lived out.” Outside the city’s jurisdiction, bar owners in the Neck ignored various laws and served a multiracial clientele. The South’s white population, both in town and country, lived in constant fear of slave insurrection. In the countryside, however, Blacks were under constant surveillance, and there were few opportunities within the grueling work regime for slaves to develop wide social connections. But in Charleston, as whites frequently remarked with annoyance or alarm, Blacks established a collective life of their own. In 1818, more than 4,000 free Blacks and slaves seceded from the city’s mixed-race Methodist churches and built a chapter of the new African Methodist Episcopal (AME) church in Charleston Neck. Because conditions in the urban South were dramatically freer than on the plantations, the state had to step in to do the job of repression that the slavemasters had usually taken care of themselves. The Charleston Guard and Watch developed by trial and error into a recognizably modern city-run police force by the 1820s, performing both nightly harassment of the Black population and staying on call for rapid mobilization to control crowds. Blacks, even free Blacks, caught out after curfew without an acceptable excuse were subject to overnight arrest by the Guard and up to 39 lashes after a magistrate looked at the case in the morning. This practice went back to colonial days and mirrored the methods of the rural slave patrols. The first major difference, even early on, was that the Guard was a paid force rather than a group of conscripted citizens. City authorities saw the AME church as a troubling expression of Black autonomy. In the church’s first year, 1818, the City Guard raided the church and arrested 140 members, citing a seldom-used law that prohibited the gathering of seven or more Black men outside the presence of whites. In both free and slave states, the AME church quickly became an important center for Black discussion of abolition, even though congregations were far from united on what steps to take toward freedom. David Walker, a member of the AME in Boston and the author, in 1829, of the militant Appeal to the Colored Citizens of the World, was probably a member of the Charleston AME in the early 1820s. Many of Walker’s views, including scriptural arguments for the rights of slaves to rise up and take their freedom, correspond to the views attributed to Denmark Vesey, a Charleston free Black carpenter who was accused of planning a massive insurrection in 1822. The threat of revolt put Charleston’s whites into a panic. The city elite, led by the Intendant (the mayor), ordered the torture of suspected conspirators, who then produced confessions that implicated several others. Within weeks, a second set of tortured suspects implicated dozens more. Guilty or not — capable historians disagree over whether there was any plot at all — Vesey and 34 other Black men were hanged, and 27 were exiled. In the midst of 1822 panic, white citizens accused the City Guard of laxity and called for professionalization and enlargement of the force. The Guard went onto 24-hour duty and was centralized under the direct command of the intendant. As the panic subsided, legislators repealed these two measures within a few months, although they did approve the enlargement of the force. What’s more, the state of South Carolina responded to the Vesey affair by building a garrison and arsenal in Charleston at its border with Charleston Neck. This building, devoted to the repression of the Black population, became known as The Citadel — and by 1842, housed the military academy that still bears that name. The troops of the Citadel were available to operate in Charleston, but along with a state militia known as the “Neck Rangers,” they also were to keep order in the Neck. In the mid-1820s, whites blamed a series of fires on Black arson, and the council responded by restoring a small daytime force, while also providing six horses to speed up communication and mobilization. Charleston thus set out 24-hour police patrols three years before the foundation of London’s police in 1829. By the mid-1830s, legislators restored the measure that they first passed in panic in 1822 — centralization of city government (and of the Guard) under a full-time mayor. Following the 1836 reforms, the city fielded a Guard force of 118, including 94 privates and four musicians. The nightly watch numbered one guard for every 263 city residents, far ahead of Boston’s coverage (one officer per 815 residents) and New York’s (one per 771). The elite achieved further centralization by annexing Charleston Neck in 1849, thus putting it under the jurisdiction of the City Guard. Previous to that, the Rangers and Citadel troops who policed the Neck represented a middle ground between rural slave patrols and modern police. Putting the Neck under the jurisdiction of the Guard set the stage for completely replacing the last citizen militia-men with uniformed patrols of paid city employees. Even before the 1820s, the Southern force was more militarized than police in the North. The Guards operated within a military hierarchy of several ranks, and unlike the first Northern police, they carried guns — with bayonets. In the first decades of the century, New York’s night watch did not go out on constant patrol, but Charleston’s did, typically in squads of five or more. Throughout the pre– Civil War years, visitors to the city frequently wrote about the Guard’s uniquely intimidating presence. The specific history of police forces varied from one American city to another, but they all tended to converge on similar institutional solutions. The nature of the police comes from the nature of the “problem”: an urban working population that has developed some economic autonomy as wage workers and artisans and has thus been able to create a self-assertive, collective life of its own. The Southern experience also reinforces the point that was already clear in the North: Anti-Black racism was built into American police work from the very first day. Toward the end, I’ll say a few words about Philadelphia, but before that, I’m going to draw out some themes that apply to all of these cases. First of all, we need to put policing in the context of a bigger ruling-class project of managing and shaping the working class. I said at the beginning that the emergence of workers’ revolt coincided with a breakdown of old methods of constant personal supervision of the workforce. The state stepped in to provide supervision. The cops were part of that effort, but in the North, the state also expanded its programs of poor relief and public schooling. Police work was integrated with the system of poor relief, as constables worked on registration of the poor and their placement in workhouses. That’s even before the police were professionalized—the constables were sorting out the “deserving poor” from the “undeserving poor.” If people were unemployed and unable to work, constables would direct them toward charity from churches or the city itself. But if folks were able to work, they were judged to be “idlers” and sent off to the horrors of the workhouse. The system for poor relief made a crucial contribution to the creation of the market for wage labor. The key function of the relief system was to make unemployment so unpleasant and humiliating that people were willing to take ordinary jobs at very low wages just to avoid unemployment. By punishing the poorest people, capitalism creates a low baseline for the wage scale and pulls the whole scale downward. The police no longer play such a direct role in selecting people for relief, but they do deliver a good deal of the punishment. As we know, lots of police work has to do with making life unpleasant for unemployed people on the street. The rise of modern policing also coincides with the rise of public education. Public schools accustom children to the discipline of the capitalist workplace; children are separated from their families to perform a series of tasks alongside others, under the direction of an authority figure, according to a schedule ruled by a clock. The school reform movement of the 1830s and 40s also aimed to shape the students’ moral character. The effect of this was supposed to be that students would willingly submit to authority, that they would be able to work hard, exercise self­-control, and delay gratification. In fact, the concepts of good citizenship that came out of school reform movement were perfectly aligned with the concepts of criminology that were being invented to categorize people on the street. The police were to focus not just on crime but on criminal types—a method of profiling backed up by supposedly scientific credentials. The “juvenile delinquent,” for example, is a concept that is common to schooling and policing—and has helped to link the two activities in practice. Needless to say, an analytic scheme for dividing society between good guys and bad guys is perfect for identifying scapegoats, especially racial ones. Such a moralistic scheme was (and is) also a direct competitor to a class-conscious worldview, which identifies society’s basic antagonism as the conflict between exploiters and exploited. Police activity thus goes beyond simple repression—it “teaches” an ideology of good and bad citizenship that dovetails with the lessons of the classroom and the workhouse. The overall point here is that the invention of the police was part of a broader expansion of state activity to gain control over the day-to-day behavior of the working class. Schooling, poor relief and police work all aimed to shape workers to become useful to—and loyal to—the capitalist class. There is the law … and then there’s what cops do. First, a few words about the law: Despite what you may have learned in civics class, the law is not the framework in which society operates. The law is a product of the way society operates, but it doesn’t tell you how things really work. The law is also not a framework for the way that society should operate, even though some people hold out that hope. The law is really just one tool among others, in the hands of those who are empowered to use it, to affect the course of events. Corporations are empowered to use this tool because they can hire expensive lawyers. Politicians, prosecutors and the police are also empowered to use the law. Now, specifically about cops and the law. The law has many more provisions than they actually use, so their enforcement is always selective. That means that they are always profiling what part of the population to target and choosing which kinds of behavior they want to change. It also means that cops have a permanent opportunity for corruption. If they have discretion over who gets picked up for a crime, they can demand a reward for not picking somebody up. Another way to see the gap between the law and what cops do is to examine the common idea that punishment begins after conviction in a court. The thing is, anybody who’s dealt with the cops will tell you that punishment begins the moment they lay hands on you. They can arrest you and put you in jail without ever filing charges. That’s punishment, and they know it. That’s not to mention the physical abuse you might get, or the ways they can mess with you even if they don’t arrest you. So the cops order people around every day without a court order, and they punish people every day without a court judgment. Obviously, then, some of the key social functions of the police are not written into the law. They’re part of police culture that cops learn from each other with encouragement and direction from their commanders. This brings us back to a theme that I started with at the very beginning. The law deals with crimes, and individuals are charged with crimes. But the police were really invented to deal with what workers and the poor had become in their collective expressions: Cops deal with crowds, neighborhoods, targeted parts of the population—all collective entities. They may use the law as they do this, but their broad directives come to them as policy from their commanders or from their own instincts as experienced cops. The policy directives frequently have a collective nature—say, to gain control of an unruly neighborhood. They decide to do that, and then they figure out what laws to use. That’s the meaning of “zero tolerance” policies, “broken windows” policies—policies that, in the past, might have been frankly termed “uppity n—-r” policies. The aim is to intimidate and assert control over a mass of people by acting on a few. Such tactics have been built into police work from the very beginning. The law is a tool to use on individuals, but the real goal is to control the behavior of the larger mass. I’ll use my last few minutes to talk about some alternatives. One of them is a justice system that existed in the United States before the rise of the police. It’s well documented for Philadelphia, so that’s the place I’ll discuss. Colonial Philadelphia developed a system called the minor courts in which most criminal prosecutions took place. The mayor and the aldermen served as the judges—the magistrates. Poor people would save up money so they could pay a fee to the magistrate to hear a case. Then, as now, most crime was committed by poor people against poor people. In these courts, the victim of assault, theft, or defamation would act as prosecutor. A constable might get involved in order to bring in the accused, but that’s not the same thing as a cop making an arrest. The whole action was driven by the victim’s desires, not the state’s objectives. The accused could also counter-sue. There were no lawyers involved on either side, so the only expense was the fee to the magistrate. The system wasn’t perfect, because the judge might be corrupt, and the life of the poor didn’t stop being miserable when they won a case. But the system was quite popular and continued operating for some time even after a system of modern police and state prosecutors developed in parallel. The rise of the police, which came along with the rise of the prosecutors, meant that the state was putting its thumb on the scales of justice. In court, you might hope to be treated as innocent until proven guilty. Before you get to court, though, you have to pass through the hands of the cops and prosecutors who certainly don’t treat you like you’re innocent. They have a chance to pressure you or torture you into a confession—or nowadays a confession in the form of a plea bargain—before you ever get to court. However unfair the system came to be as it was dominated by cops and prosecutors, the minor courts had shown Philadelphians that an alternative was possible that looked a lot more like dispute resolution among equals. That’s the key—we can make an alternative available again if we abolish the unequal social relations that that police were invented to defend. When the workers of Paris took over the city for two months in 1871, they established a government under the old name of the Commune. The beginnings of social equality in Paris undercut the need for repression and allowed the Communards to experiment with abolishing the police as a separate state force, apart from the citizenry. People would elect their own officers of public safety, accountable to the electors and subject to immediate recall. This never became a settled routine because the city was under siege from day one, but the Communards had the right idea. In order to overcome a regime of police repression, the crucial work was to live up to the name of the Commune—that is, to build a self-governing community of equals. That’s still pretty much what we need to do. This is an edited text of a talk I gave in Chicago in late June 2012 at the annual Socialism conference. Audio of the talk is available at wearemany.org, but the text here corrects some mistakes I made back then, and I made a substantial revision to the section on Charleston after I visited there in March 2016. Special thanks to South Carolinians Mary Battle, Alphonso Brown, Nic Butler, Sara Daise, Curtis Franks, Harlan Greene and Christine Mitchell for enlightening discussions of this history. I’m now working on a book-length treatment of the subject for Haymarket Books. Thompson, E. P. The Making of the English Working Class. Vintage, 1966. “New Year’s Amusements,” New York Evening Post, January 2, 1828. Chapman, Anne W. “Inadequacies of the 1848 Charleston Census,” The South Carolina Historical Magazine, vol. 81, No. 1 (January 1980), 24-34. Hinks, Peter P. To Awaken My Afflicted Brethren: David Walker and the Problem of Antebellum Slave Resistance. Pennsylvania State University Press, 1996. Powers, Bernard E. Black Charlestonians: A Social History, 1822-1885. University of Arkansas Press, 1994. Schweninger, Loren. “Slave independence and enterprise in South Carolina, 1780–1865,” The South Carolina Historical Magazine, vol. 93, No. 2 (April 1992), 101–125. Wade, Richard C. Slavery in the Cities: The South 1820–1860. Oxford University Press, 1964. There’s an assembly at the Garda Station in Drogheda this Friday evening at 8pm to protest the ongoing arrests of water charge resistors. The attached article on the origins of police forces show that from the outset, policing was political. it was set up to control strikes and protests in the interests of the state and capital. As the adopted mixed-race Colombian son of a working class Irish family, whose relatives include many cops and firemen, I want to personally thank you for taking the time to cultivate a comprehensive, well-thought-out piece detailing some the reasons why we are experiencing the complicated issues between law enforcement and marginalized citizens, particularly in New York City. I will be referring this piece (and your references) to as many people as possible when this discussion comes up. Really well done, cheers. Thanks! It’s also available at: https://independent.academia.edu/DavidWhitehouse1. It’s on page 16 of the first volume of Selden Bacon’s work (see ref. above). Unfortunately, it’s an unpublished PhD thesis, so the only way to get it is to pay for University Microfilms to print it out for you as paperback facsimiles. We’re talking about New Amsterdam around 1650. On closer inspection, I see that the ordinance only applied to workers in the harbor area — and to their comings and goings around that area. That’s not too surprising, because these were otherwise the most unsupervised workers in town. A significant number of the people doing farm work or housework for the Dutch colonists were African and Native American slaves, whose movements around town were quite restricted (Bacon, p. 65). Reblogged this on Common law Academy. Reblogged this on Gutter Stained Glory. Pingback: Origins of the police | Works in theory | א.ל.ו.ה.י.ם . א.י.ת.נ.ו! An Excellent Piece by Kropotkin details the switch from a justice system that serves the Victim, to one that serves the state. That was the most interesting article I’ve read in a long time. Extremely thought provoking. I read this story with great interest and it states that the Police Organization in the Authors mind began after communes of the working class decided they’d like to take care of themselves and after a lot of crime took place in New York, South Carolina and Philadelphia, it’s a good story. I was born in Philadelphia, Pennsylvania and I was a Magistrate and now I am Marshal and I agreed Philadelphia way back then had a great system of courts where if you had a problem with your neighbor you could pay the church to help you resolve it. I understand the Organized Police to have a System of enslavement that was spoke of that involves Slavery as the Author points out that Slavery existed in New York City until about 1829 as it did it was brought back to Albemarle, County in 1808. What kind of Slavery am I talking about you might be thinking and well it probably is the kind where your set to work at hard labor as a farmer for bread and water and beat when you’re bad and the most interesting part about all of it is is it seemed to work at keeping the United States of America together from Massachusettes to South Carolina up until the death of the United States Supreme Court just prior the the American Civil War of 1861 – 1865 proving that there is a need for a county system of government and a Marshal to travel between the two extremes of City and County Politics to try to find reasonable solutions to difficult problems and I believe that the Marshal is probably the one they mean when they say “The Philadelphian” as a sort of mythical Pheonix, of sorts. In 1737, George II began paying some London and Middlesex watchmen with tax monies, beginning the shift to government control. In 1749 Henry Fielding began organizing a force of quasi-professional constables known as the Bow Street Runners. The Macdaniel affair added further impetus for a publicly salaried police force that did not depend on rewards. Nonetheless, In 1828, there were privately financed police units in no fewer than 45 parishes within a 10-mile radius of London. Even if there is substance in the balance of the article, I only got as far as the transparent, erroneous, and false claim that police forces were started in a few decades between 1825~1835. It’s quite a pointed statement, which is easily shown to not be accurate. Whatever case is attempted to be made after this, proceeds from this false fact, and I many other things that demand my time. Also from Wikipedia: The Bow Street Runners “did not patrol but served writs and arrested offenders on the authority of the magistrates.” In other words, they were not modern cops, who are distinguished by their roving presence and their power to arrest on their own discretion. Constables act after citizen complaints are processed through a judge (unless they witness a crime themselves). acourtain might have benefited from reading the rest of the article, but I can’t tell for sure. Further, the discretion of cops includes the discretion to use violence to obtain compliance with a broad range of “legal orders” — a power that goes far beyond what constables could get away with. There was variation, of course, in how this power expanded, and how quickly. In the slave South, this power already existed in the hands of all adult white men whenever they dealt with Black people. In the North, police power to use violence expanded rapidly in the 19th century, much faster than it did in England. My thesis is that the new characteristics of the police corresponded to emerging characteristics of the populations that were to be policed. Officials authorized discretionary police violence because of a rise in the defiance of authority among urban working populations, especially collective defiance. Almost everyone neglects another major root or antecedent of policing in the US — after the so-called Mexican-American War (1846-48), when the US conquered and annexed Texas, Arizona, New Mexico, Colorado, California and part of Wyoming, there were created the Texas, Arizona and California Rangers (the first named still exist, and not just as a baseball team). They started as basically vigilantes, funded by the new ranchers and landowners on the stolen land to suppress and contain indigenous/Mexicano resistance, and were absorbed into the state apparatus as “law enforcement” organizations. This is a fundamental part of the US mythos and manifest destiny ideology of white supremacist settler colonialism and conquest, and also represents not just the expansion of slavery but its reimposition in areas where it had been previously abolished. But despite all the Davey Crockett/Texas Rangers/Lone Ranger mythologizing that is part of the ideological cement of “white” pseudo-culture in the US, left critiques of policing and other forms of white supremacy almost always leave it out of their narrative. It even ties back in to the business about the Irish, because some Irish, who joined the US Army to seek citizenship and then found themselves invading Mexico during that war and switched sides.